Either you have purchased something from outside the EU or you’re receiving some gifts from your family and friends. If they haven’t sent it “properly” it will most likely end up waiting (and waiting) for you at the customs office in Barajas airport – to avoid this as much as possible check out our Sending and Receiving Packages blog for some hints and tips. When your package arrives in Madrid it will probably just sit there for a while. It’ll get weighed, possibly opened and the value of its contents might be evaluated. You’ll receive a letter in the mail called an “AVISO DE LLEGADA” which will contain the basic information about your package: who sent it, where it’s coming from, so on and so forth. The letter will refer you to www.adtpostales.com but to save some time, just head straight to http://www.adtpostales.com/acceder.asp. This is where you begin your journey to rescue your package by filling out information about the parcel. Mi nombre es “JOHN SMITH” con Pasaporte: “YOUR PASS/ID Nº”, me pongo en contacto con vosotros tras la recepción de una carta de la aduana por la retención de un paquete a mi nombre. Os adjunto toda la documentación requerida. Quedo a la espera de noticias para poder recoger mi paquete. If you are having trouble finding the information you need to complete the letter or the form itself, take a look at the photo below. Remember to sign the form and upload it to your computer and to the website with the other 2 documents. Once you have all the 3 documents filled and uploaded, you’re adventure is almost complete! Once Correos receives all the information they’ve asked for, you will receive another letter in the mail telling you that your package is ready for pickup at a nearby “Correos” office. In the off-chance that you are lucky, they might even deliver it to your door, but they’ll also charge you for that! Once you get to the office, or the delivery is made you’ll have to pay a tax fee – yes, even if the sender requested to pay for all fees on their end, you will still have to pay a tax. The amount of taxes you have to pay depends on the value of the contents, so try to lowball the value as much a possible. But, remember, the value you indicate and the value the sender has indicated MUST match. And there you are! 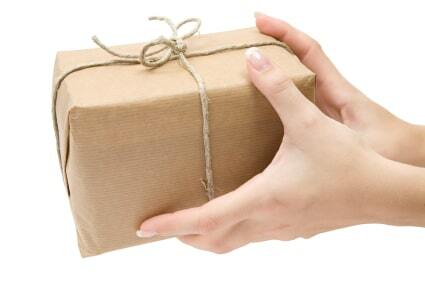 Hopefully you will rescue your parcel in good time and enjoy whatever gifts come your way! HINT: In case you would like to send a package from Spain to home, check out CangoBox – probably the cheapest, easiest & most reliable way at the moment to send packages at least within the European Union. Read more by clicking here! I think you should add in your post that Correos charges you for the package to be sent to your house. I have a package stuck in Madrid that a friend sent for my bday. I only have a passport – idf I use a friend’s NIE do i use their name also or can I use mine. Also, I don’t want to accept the package if the taxes are too much – IS there a way to estimate the cost before it arrives in Barcelona (where I am)? If I don’t pick it up in Barcelona will it still be returned to sender? So, the package has been sent to you, so you cannot use someone elses documents to pick it up. I dont know why the package is in Madrid, it was meant to be sent to Barcelona. So I am very confused about the advice you need from me. If you never go to pick up the package it will be sent back to sender but they might be subject to a fee since it was never picked up. Hi! This article is very helpful for me. However, I cannot get passed the login page on the website. It says my DNI is invalid. I put in my passport number. Is this incorrect? Any help would be greatly appreciated. I’ve been trying to figure this out for a week!! Hey there, the “numero de envio internatcional” is the code of your package! The code should be indicated some where on the letter or slip you got in the mail! Let me know if it all works out! I have to write a letter since the package I received is a gift from a family member. Do I upload the letter to the server where it indicates I am supposed to upload proof of payment? Or should I send it to the email they provide? Or something else? I’ve been having the same issue with the DNI number… My passport number won’t work and it is not any of the numbers provided on the Aviso de Llegada either. Did anybody figure this out? I even went to Correos today and they told me there’s nothing they can do and that my package will just be sent back if I don’t get past that. How do you upload anything to the Correos server though? I keep getting directed to a page requesting a Cl@ve pin, which I do not have. I have the NIF number of the woman I’m living with in Spain, but that doesn’t seem to help me at all. Hey everyone! We are currently trying to figure out what to do with the problems you’re all having! I didn’t have this issue personally so I have to go through some trial runs and see what’s going on! Sit tight! I was expecting 3 parcels with some makeup and toiletries from Korea. They have been held at customs for almost a week now and 2-3 days ago I filled and uploaded all the documents they asked for on the ADT Postales website. But it says that the validation of documents is still pending. Does anyone know how long it takes and how to speed up the process? I live nowhere near Madrid, so picking them up myself is not feasible. Hi Heide, I’m sorry to hear that! unfortunately there is nothing you can do. How long have you been waiting? please can u let me know how u paid? im having a difficult time doing so, hopefully u recieved your parcel? Thanks for this facility. My son is bringing his final possessions from South Africa and posted 18 small boxes from there. We received notification that 9 are in Spain now. We are having great difficulty providing the documentation ADT require but are slowly getting there. (We filled in forms 2+ weeks ago on the site but these were deemed inadequate). We have battled to get what they require but are almost there and are now resubmitting. Only to find that at least one of the shipments has already been classified “Return to Sender”. The sender (my son) now lives here in Spain!! He was told by the SA post office to put a Spanish RtS address on the paperwork, so goodness knows where ADT will send it. Our translator tried to phone ADT to ask for an extension of time but could not get through to anyone – well she eventually got through to one man and was cut off as soon as she said her name. PLEASE do you have any advice on how we can contact ADT to get them to keep the boxes longer so we can get all the paperwork uploaded to them? Good morning Ann! Just reading through your comment now. You’ve done a great job at being patient during this ridiculous process! Unfortunately there is nothing you can really do to slow down the process of the returning package. The only thing I can suggest to you is to keep calling relentlessly – I’m sure you have been to this page already, but just in case here is the link to the contact information of ADT Postales. Let us know if anything progresses! Hello Everybody, thanks for sharing your troubles. I’m in a similar situation, bought some motorcycle parts on Ebay US (for approx $ 300). The parts have been sitting at Spanish customs since end June. When I noticed it is not moving forward and started reading your posts, I also logged in with my NIE number on adtpostales.com/acceder.asp. All the info about my package is there, except the fact that I could not upload any of the required documents and I got some messages about that the package will be returned to sender. Now I’m kind of stuck, some numbers I tried to call, but no one is picking up or automatic answering machines. Any tips? Hi Frankie! We have a few possible suggestions. First, the server might not let you upload because you don’t have the correct amount of documents to upload. Have you completed 3 documents listed above? 1)passport copy 2)proof of purchase 3) A completed “aviso de llegada” form which Correos should have sent you? Since this is not a gift, you should not need the 4th) “letter” which states that you are the receiver of the gift. Second, since the account was not logged into within a decent amount of time and they are sending the package back – they might have disabled the option of uploading anything onto the page. You could try uploading the documents and sending them via email to Correos. I have never tried this, but it could work! Hi Steve, 5 days is not very long for it to be at customs. It is probably waiting for it’s turn to be inspected and then for them to send the Aviso letter to you OR they will send it to a Correos office near your address for you to pick up. It depends on the contents. Do not panic yet! Your Canadian courier has done its job and is no longer involved in the process! Hopefully you get the letting in the coming days and then you can start with the process of getting it to your piso. Hi Steve, I am in this exact situation now (wish i read about Spain before sending my gift…ugh). What ended up happening with your package? What was the process and how long? Thank you in advance for the advice/response.!! Hi, I also sent a box from the US to friends in Spain on 11/24/17. It cost me $110 to ship. The post office insures it for $200 and I made them mistake of entering like $180 as the cost of gifts. It got held up in Madrid Customs on 12/4/17 and is still there. They sent a letter to our friends wanting to know the content and what each item cost (no item was over $40). He sent it back right away and they contacted him in a few days saying he had to pay $104 before they would send him the box. Now, from what I have read on the websites, they are not supposed to tax on gifts. Which is what I wrote on my customs form and he wrote on his, but they still did. And everything was wrapped in Christmas paper too. So basically I just spent $237 (bc I had to pay fees to send money Pay Pal as well) to ship a box of gifts probably worth the same. Very, very upsetting that they do this as I received the box the sent to us and I did not have to pay any fees to get the box. Lesson learned, I will now limit what I send and in a much smaller box. It is a shame it needs to be this way. I plan on putting a complaint in (not that it will probably do any good) as to why we were charged on “gifts” once he gets the box in his possession. Hello! My package from USA been held by Customs from 8.12.16. I already ask send it back. But they never explain why they hold and person who I send it said she didn’t receive any letters. The website shows me it’s is a problem, so I can’t open. The phone numbers I try to call in Spanish, so I don’t understand plus a time difference. The person who I send it already left the Country . Please advise what can I do? I have been waiting for my package which was sent from home USA . I am in Spain now and it has been stuck in Madrid customs for a month now . Everyday they ask for documents and we send them and the next day they either ask for something new or the same paperwork . I call they can never help me other than by saying to resend everything . I am in need of my orthotics which are in the package . Idk where else to call or what else to do ? Any help here ??? Hi Vanessa, we are not directly associated with Correos in any way. So unfortunately I can’t help you get in contact any more tan you already are. If they are asking you for documents, and contacting you within the next day for more documents then just make sure you are following all the steps they ask for, as well as all the steps that have been carefully laid out here in this article. This has been a nightmare, I’m lucky enough to live in central Madrid either 17 minutes drive to Barajas cargo area or 30 minutes on metro direct (with a short 15 minute walk from the Metro station at the Barajas end). Ok this is what happened, I usually get imports (non EU) delivered to my door at Madrid via Correos.es and I pay cash for the import duties (fair enough) and have been doing so at the same address for over 2 years but one day I get a letter through the mail stating that an item is at Barajas / correos and I had to trundle up there and pay cash. So I get a taxi ..(17 Euros) and walk into the Correos post office at Calle Alfa to be greeted by two queues, I went to the registration queue and they gave me a form to fill in which I already filled in at home and tell me to walk outside down the street to a different building which is the Agencia Tributaria (Inland revenue in the UK and IRS in the U.S.), so I go through security control in there and queue up.. the woman there asks me for receipts Paypal etc. and I hand in the filled Correos document for which they gave me in the other office, she then takes copies and instructs me to go home and pay via bank transfer and get proof of payment from my bank, I protested and informed her that’s not what the original document instructed me to do (It stated that I could pay in cash) .. she just gave me the hard stare behind the screen .. so reluctantly I went all the way home and waited the next day for the banks to open again (they close at 2pm). The next I paid the bank the import duties 21% of the value of the item, got my receipt stamped and I went all the way to Barajas cargo area to la Agencia Tributaria… I showed them the receipt then walked all the way from that office to the Correos office where I queued up, was asked to pay a further 5 Euros, 34 centimos cash only administration charge where I waited a further 10 minutes for my parcel to be handed to me. So in all 4 legs of a long journey travelling distance, on average 25 minutes each way, 5 long queues (bank payment included) and to add insult to injury 5 Euros 34 centimos for nothing. I am furious. And another thing don’t let my English deceive you, I am a Spanish national, who knows how much harder it would have been to process this had I been foreign (would have had to get proof of residence documents aswell as the usual invoices and paypal payment receipts)… very angry indeed. This is a scam to get money out of you and or to deter you from importing things into Spain. I know there are scamsters that import cheap and then sell on claiming it’s for personal use or claim that the value of something is 1 euro when in reality it’s worth thousands but damn that aint me, the value of the contents were printed on the box ! why not open it, seal it and investigate the value and see if it corresponds then just bring it to my door and I pay the import duty ? why make me do triips to dullsville etc ? Thanks for sharing! Sorry this happened to you! Can anyone tell me if there is a way that one can by-pass correos and get a customs handling agent to clear a package and deliver it? ADTPostales ‘lost’ a consignment and could not tell me what happened to it – it has been resent and is now in Customs at the airport in Madrid. Going there is not an option – I will need to get someone else to do it for me. It is my understanding that customs and Correos at Barajas are one in the same. If they haven’t released your package or sent you the documents telling you to pick it up somewhere, you have to wait. But this is the extent of my knowledge. Try giving the Correos a call and see if they say any different. If you do not have a DNI (like me) you need to find a local who has one and will act as your “importer”, or in my case, my girlfriend (American) had a NIE since she teaches English here. Create an account here: http://www.adtpostales.com/nuevousuario.asp and use their name as the person importing on your behalf. You will need their address also. In the last step on the site, you will print out your completed document, sign it, scan it, and upload it. You will also need to upload a copy of their DNI or NIE. I have a question??? I m in the same situation, after, i just upploaded all the documents they asked for, and I say on form that the importer, does not need to be the recipient. (destinatario) My question is, after your girlfriend acted as the importer, was she also suddenly the new recipient, i mean did she have to get the package for you? Or was it still sent to you? How do you upload a copy of your NIE? My NIE number is on my student visa, so I uploaded a scanned pdf of my student visa and Correos rejected it. I need to provide a photocopy of my NIE but I don’t know how else to do that. The NIE they need is the actually NIE card, not the one within your passport. I suggest getting a friend to upload theirs for you. Thank you for your response! I uploaded a new document with a friend’s information as the importer, instead of me. She is a Spanish citizen so hopefully they accept my new document and the photocopy of her DNI card, even though I already posted an original document with my information as the importer. I am in the same situation (waiting for my NIE card but needing to get a package). Did you ever get your package through your friend? I have someone with a DNI I can use, but want to make sure the original document won’t mess up the new one. When your package is being held hostage at Barajas just require an official inquiry about your package from your sending post! After 2 weeks you will probably get the answer that they have tried to contact the recipient but he/she didn’t provide the required documents on time, so your parcel is in the process of returning to the sender! This is from my personal experience! Yesterday I got the parcel I sent from Belgrade to Barcelona to my daughter three months ago! Never again! I ordered some workout supplements from a US company. My package has been held in Madrid since February 5th and it is now February 12th. However, I have not yet gotten my aviso de llegada. How long does it usually take for them to send the letter? I am afraid my host family got it but then threw it away and never told me. If that happened, how can I request another? Hello, I have sent all documents required for my parcel to be sent on, but my official NIE has been rejected twice, asking for an NIE Tax certificate registered with the AEAT. Can’t find this, and despite verifying that I pay taxes through my lawyers office, Barajas have still not sent my package to me. 2 weeks now and counting !!! Hi there, I read through all these comments and seem to have a similar issue. I am currently studying in Madrid and a care package from home was held up in customs. I would like to go to the website to upload the necessary documents but it asks me for a DNI, which I do not have (other than my passport number which doesn’t work). Did you ever figure out how to bypass this? Thanks! Hi so i sent a box of clothes for my sister in Barcelona since feburary 2nd and it got to Madrid on feburary 6th. And they alredy sent my sister the aviso paper where she had to list her items and she sent it a week ago and we still havent heard anything about the box im tracking the shipment and is not moving or nothing. Is there any advise you can give me ? Im very disappointed at this moment because i sent expensive stuff thinking it was going to get there and we havent got nothing from them . Do you know how long they would take to ship the box ? I get parcels from the US to here in Cadiz. Some get caught in the system, others are couriered straight to my door. The trick seems to be to get the sender to mark on the documentation ‘Returned Sample’ and then they assume that it’s already been in the country and is just being returned. Might not work every time, but worth a try. I ordered camping gear from REI.com worth about 240 euros. Aduanas snatched it and after going through their tedious process they are asking me to pay 114 euros to get my package. Completely ridiculous, I prefer to not pay and get a refund after they return the package. My son is in Madrid for study abroad, he had his phone stolen. He is staying with a host, an elderly women. Just saw that it is being held in customs on the USPS tracking. I sent him a old phone that we had activated. I put down it was gift worth $100. I figured he would have pay a tax and some sort of ID to pick it up. Why does a student need a NIE number? all he has is passport and his us ID. Can’t he just go there in person and pick up? I believe he not far from airport, short cab ride? i already sent then the documents they asked me to send to them and its almost a month now since then but i still dont have it yet and i kept on tracing my parcel and theres no new on it, it didnt move at all. Hi. I hope someone can give me some advice. I bought an item online from a vendor in Ukraine. I am in South Africa. This was almost a month ago. When I track it it states that there are two items with the same tracking nr. The one shows it left Ukraine, then a week later it entered Spain and is now held at customs. Can it be by coincidence that this is a different package? Or is it possible that it is my package that was sent to Spain by mistake??? How can I resolve this? Does anyone have a phone nr that I could phone to put me in contact with the right person in Madrid airport Customs (packages) ? I sold a valuable item to my friend in Spain. When I filled out the custom forms when I mailed it I put the value, about $400 USD. I did this so I could add insurance to the package. She only paid 80 Euro. I made her an invoice for the 80 to send to customs. Is this mismatch a huge problem? I’m so worried! It’s been in customs 8 days already and she has sent the required documents already. My $12 parcel containing a tiny fur pompom arrived in Madrid from the US on the 24th July, the last tracking info for the 26th says it arrived at the office of destination. My local office says it’s in Madrid. I assume I don’t pay duty and taxes on something for $12? I am confused why it’s still there. Today is 7th August. 25 days since package arrived att madrid, sent all hade to fake dni NO other way passning That. Ordern for 15 euro hade to pay total 50 euro fees. How is this even legal. Hello, I’m studying in Spain and my family is trying to send me a package. I have not received the “Adviso de Llegada” in the mail and my package has been in Madrid for just over one month. In addition, I do not have a DNI number. Is there a way to contact Madrid customs to get this form? What can I do to get my package without a DNI number? Any advice would be appreciated! We have not received a letter or anything from customs and the package has been held for two weeks. What can we do? Did you figure it out? I am currently waiting for a package as well. Hi my package is stuck as well. Any updates on your package? Don’t know what to do. Im trying to get my package out of customs, When I try to enroll through the ADT website it ask for my DNI number, I am here in Palma from the states. How do I create and account, Do they have a customer service number? “Si es persona física que carezca de nacionalidad española, no obligada a disponer de NIE o estando obligada se le asigne un NIF con carácter provisional (NIF M). Hi, I also sent a box from the US to friends in Spain on 11/24/17. It cost me $110 to ship. The post office insures it for $200 and I made them mistake of entering like $180 as the cost of gifts. It got held up in Madrid Customs on 12/4/17 and is still there. They sent a letter to our friends wanting to know the content and what each item cost (no item was over $40). He sent it back right away and they contacted him in a few days saying he had to pay $104 before they would send him the box. Now, from what I have read on the websites, they are not supposed to tax on gifts. Which is what I wrote on my customs form and he wrote on his, but they still did. And everything was wrapped in Christmas paper too. So basically I just spent $237 (bc I had to pay fees to send money Pay Pal as well) to ship a box of gifts probably worth the same. Very, very upsetting that they do this as I received the box the sent to us and I did not have to pay any fees to get the box. Lesson learned, I will now limit what I send and in a much smaller box. It is a shame it needs to be this way. I just realized my package is stuck in Madrid, but I didnt get any mail or something, I found out it by tracking number. How can save my package? I can’t open any app or anything, it always says error. Hi there ,My package is stuck in Madrid and they asked me to send the invoice but unfortunately the sender lost it, so what should I do? Hello, so how can I get some sort of proof or documentation why my package is being held in customs? I sent a return package via USPS to a seller in Spain. Been held in customs since 12/7/17. I would like to know reason; whether the recipient needs to come and get it, or there is customs tax on it. Can I receive this information as the sender? How? Hey Charlene! I’m afraid you’ll have to contact the Correos office in Spain with you questions. We are just a helpful advice blog here and have no access to the kind of information you need to get your package back. Sorry! Hello, I sent a package from USA to my brother who is living in Spain. I valued the package for $500 so I can get insurance. Now, it has been held a week in Customs, Madrid. My brother lives in the south, Alicante. In the website adtpostales.com, I managed to find some information regarding my package. It is a letter-datos para la tramitacion de importacion. I filled it out and even handwrite a letter, stating who is the recipient and what is in the package. Could you please advice me where to send my letters and what else to do? I am readlly concerned with everything I just read here. Do you know how to pay the fee that Correos sends you? I have been sent the amount (ridiculous), but am unclear how to actually pay it (do I go directly to the airport? Do I go to a bank? ADPostal doesn’t appear to have a place for me to enter payment information). There are no clear instructions on the paper – it just says to transfer or deposit into the Postal Office Account. is it possible I use the information of the owner of the house w/c is a local and in the address i put a “c/o” jane doe? I got a package in February (it’s now April). I filled out all the paperwork and even paid for it to be released, but now online it says they are inspecting it and will email me when the next step is done. That was over a month ago. I don’t know what to do to get it! Any advise would be great. Hello! I have a question. I have nominated a friend in Barcelona with a DNI and /or an NIE to be my representative. Great. Done. However, with the form I need to fill out (DATOS PAR LA TRAMITACIÓN de IMPORTACION CON CORREOS), the last part to sign asks for the signature of the ‘destinatorio’. That’s me. That’s Fine….BUT…then, it asks for the DNI de firmante! Which obviously I don’t have a DNI – exactly why I nominated my friend with the DNI to be the representative (importador). What should I do? Shall I just put her DNI next to MY signature? Or, shall I just put my Passport number? P.S. My box has been in Madrid for 2 months! I never received the letter de Aviso de Llegada letter! I had to email them, and they told me to take the steps online to fill out forms. I tried your link to http://www.adtpostales.com/acceder and it came up as an error! Any thoughts? 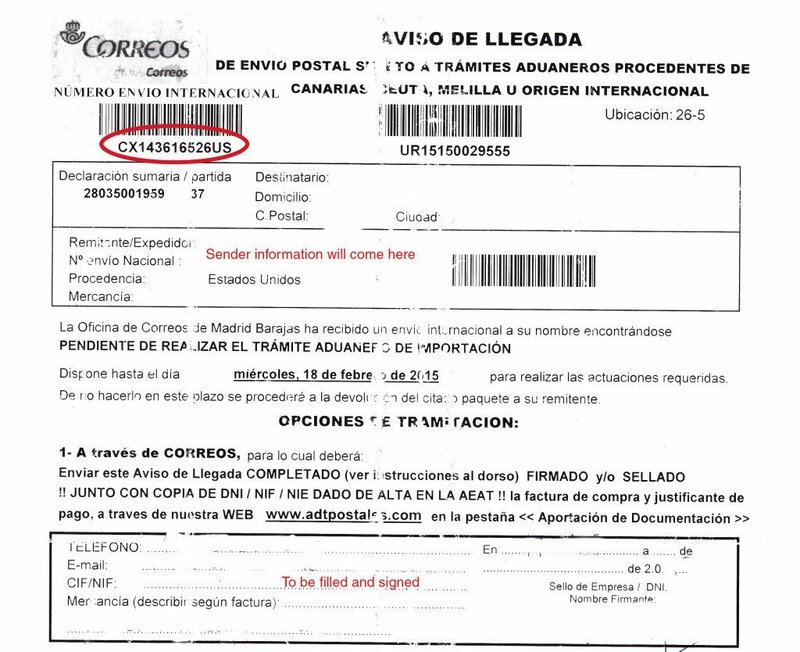 Having had no problem whatsoever in years past sending a package to relatives in Spain, this time around, a package sent to same relatives in Spain last March of 2018, said package is being ‘still held’ by the Aduana Madrid (Madrid’s Customs) even though, the specificity of its contents was on the USPO’s customs form including $ value and if a ‘gift’ declaration. Madrid is requesting sender’s passport number, recipient DNI (passaport equivalent for Spaniards and the same ?? ?s already specified in the USPO’s customs declaration form. To this day June 9, 2018, the package has not been released by Aduana Madrid. U-N-B-E-L-I-V-A-B-L-E! hi i went to Madrid last week for 5 days and on the Monday day i realized i forgot my credit card and driving licence in which was needed for Thursday to rent a car. I checked online which said it would take two days. so i got my mum to post it to me. on the tracking website it says its been in Madrid since Wednesday but i think its stuck in Barajas. is there anything i can do? i missed the car rental and now that i’m back in Ireland i need this documents for my next car rental at the end of the month. please help. 2: Phone: am told there is no pkg with the number of the international code. 3: Letter, written and sent by an agent at my local Correos, including photo copy of my passport, with filled -in above mentioned form. 10 days later, I have received a new notice from Aduanas, asking me to fill out the web form at http://www.adtpostales or the pkg. will be returned to sender. I do speak Spanish perfectly., yet this run-around is most irritating. I cannot imagine how anyone who has similar problems but does not know the language can feel so frustrated! I do notice blogger DMM-05371 has the same problem, but there is not an answer to his plea! Thanks for publishing this page, it is very useful! I recently purchased some boots from a company based in Spain but unfortunately it does not fit, so I returned it via US Postal Service. Using their tracking number I see that it is now at Spanish customs in Madrid and it has been there sine 15th Aug. Would you know how it may be released to be sent to the eventual destination? Is there anything I can do to expedite from the US? Thanks for any advice you can provide. 1:Recibi aviso de CorreosExpress-ADT la retención con numero de envio de importación CH044290638US 2: En su pagina la web, mi numero de pasaporte no se accepta como DNI en el formulario. 3: por telefono, me advierten que el numero del envío no existe. 4: Al mandar carta con el formulario y mis datos, no he recibido contestación ni acuso de recibo. 5:el paquete no ha sido recibido de vuelta a USA. Nota: el paquete contiene 4 platos de vajilla, nada fuera de lo normal. Hoy me entero que es una empresa privada que parece dejar mucho que desear en su manera de proceder. Le agradeciria informarme de cualquier detalle sobre el tema. Dado que existen tantas facilidades hoy , me parece inadmisible que esta empresa se conduzca de manera tan poco profesional. Ahora solo doy por perdido el paquete? Los datos personales incluidos en el formulario y derivados del estudio de la queja y/o reclamación serán tratados por “Sociedad Estatal Correos y Telégrafos, S.A., S.M.E” (en adelante, “Correos”), con CIF A-83052407 y domicilio social en Vía Dublín nº 7 (Campo de las Naciones) 28070 Madrid (España) con la finalidad de poder gestionar y tramitar su queja y/o reclamación. Adicionalmente, Correos utilizará esta información, de forma agregada o individual, para conocer los motivos de queja de sus clientes y poder mejorar la prestación de sus servicios, por entender que existe un interés legítimo que ampara esta actividad. No está prevista la comunicación de sus datos a terceros, salvo obligación legal o salvo que su queja o reclamación se realice sobre los productos y servicios de otras empresas del Grupo en cuyo caso se comunicará a esta empresa para su gestión. Puede ejercitar sus derechos de acceso, rectificación, supresión, oposición, limitación o portabilidad solicitándolo a la dirección postal remitente o al e-mail derechos.protecciondatos.correos@correos.com. Debe acompañar copia de su DNI. Of course, i have heard nothing since! ADT postales held my package asking me to list the contents. Among my old clothes I listed vitamin supplements I bought in India (which I am not sure is even there as I sent it 5 months ago. I have listed 40 euros as total value of the parcel. However, this company changed the price for the vitamins to be 15 euros and now asking me to pay 48 euros for it. Why do I have to pay this tax? The stated value of my parcel is 40 euros, it is personal effects. Why do I get charged? Adt Postales IS THE WORST! I’ve never seen so many complaints for a postal service. I sent a package at the end of June and it’s still being held. At this point (4 months later) i just want to get it returned to the original address (in California) and even for that they are requesting new forms that I have no idea what they are. My friend who lives in Barcelona and was suppose to received the package said she’s not paying the taxes (they cost more than the jacket I bought and was sending to exchange the size only) and request ADT to send the package back but they said that unfortunately they can’t do that. Shoud I considered my package lost at this time? Is there any email to write to them? Or any other suggestion on how to get the pachage returned to sender? I have had a package stopped from USA, value of $19. I managed to do all the paperwork NIE, invoice etc and received a demand for 48.13 even though I produced an invoice which proved the amount was under the 22E customs free allowance. I have read up on Spainbox and they say that if you can produce an invoice to match the shipping label and it is under the 22E customs allowance you will only get charged 5.34E. How is it legal to charge me 48.13E. Has anyone had similar experience. Has anyone managed to talk to customs and get an explanation. I purchased an item on Ebay over a month ago and Spains stupid Customs dept is holding it hostage. I live in the United States. Why would Customs hold my package hostage when its leaving Spain. Hey dumb asses, your supossed to stop packages coming in to Spain. I have my own Customs dept that will handle it over here. Qhere do you get off holding my package for 2 months! Criminals! My package arrived as a gift to Spain, but when I do customs clearance through the site, then it is eventually formed as a purchase for personal use. Is this normal? The parcel is shipped with a declared value of 40 euros. I indicated this price on the website when filling in the questionnaires. I am trying to register at http://www.adtpostales.com/acceder.asp, and each time I put in my NIF it says it is incorrect even though I am typing it exactly as it is written on my NIF card. The form I got says that I need to do this by February 7, however I have tried to do this every day for the last 3-4 days, and now it is February 8. What can I do if this is not working? Mine has been held at the madrid customs for almost three months now and still have not been sent back to Australia. We did all the paperworks for it, but they refuse to give it to me. I’m worried that it was been lost, taken, or they just refuse to send it back or give it back. Just to say, this nonsense happens even if you buy online from a EU website which has a fulfillment centre in an EU country. Eg Amazon.es or Thomann.de. I’ve had to wait weeks so far to receive some electronic music gear worth 170€ because the customs process is so bad. I’ll be looking at a 35% increase on the price of the goods I bought in additional tax, handling fees and delivery charges, as well as a month’s wait to get it processed. This is pretty normal for any package which catches the eye of a Customs Officer in Madrid. It makes buying online a joke. They are probably doing it on purpose, to deter people from purchasing goods from other countries; they want you to spend your money locally instead. Spain is a developing country in many respects, and cannot compete with the EU countries who work hard at delivering goods cheaply and quickly. Unfortunately Spain’s attitude toward business is still very much ‘Mañana, mañana. Let’s all have a siesta’ – it literally hasn’t changed at all in the last 30 years. Geographically beautiful, and some lovely individual people, but why they collectively make it so needlessly difficult to get anything done is beyond me. It’s a very frustrating culture/attitude if you are used to living in UK, Germany or the Nordic countries. Also to say, my family stopped sending presents to their grandchildren because the parcels would get lost or destroyed so often, or accumulate surcharges which were more than the contents of the package. Now they wire us the money, and we buy some gifts locally.